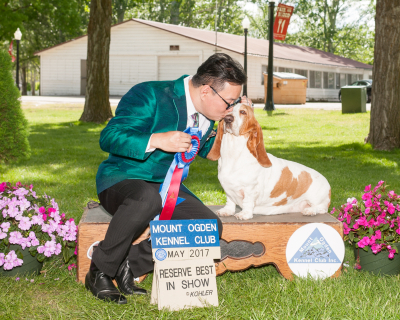 Sweetpea began her show career at 6 months at the Basset Hound Club of America Nationals in 2013. 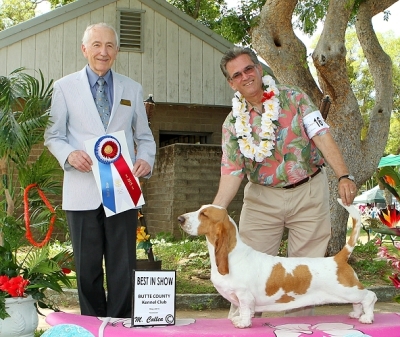 She won Best in Sweepstakes and won the 6-9 puppy class. She finished her Championship early on She has beautiful reach and drive, a matched front and long elegant neck. 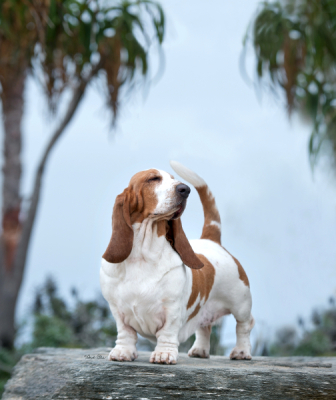 She does have a mind of her own, like her mom Violet, but she is easily won over to your thinking. She loves to snuggle and likes to sleep on 7 crate pads that are folded in half. You see her on top of this heap of crate pads and it reminds me of the Princess and the Pea! 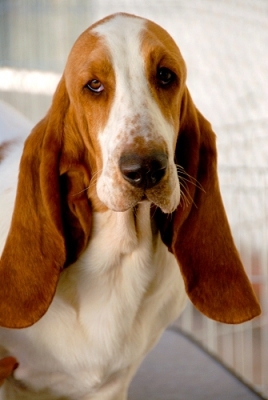 Sweetpea has a wonderful personality and is quite athletic. She loves to play with her brother Oliver and her cousins Annie, Magpie and Billy. She adores her Aunt Dolly and they jump from dog bed to dog bed and run all around as if possessed!! Squeaky toys are her passion and removing the squeaker from the toys is also her delight. There is not a toy she can’t destroy but has the best time in doing so. 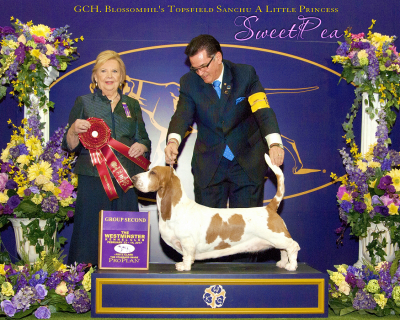 On February 13, 2017 Sweetpea was awarded second in the Hound Group at the 141st Westminster Kennel Club show under Judge Mrs. Polly Smith and Best of Breed by Judge Mrs. Kimberly Meredith-Cavana. 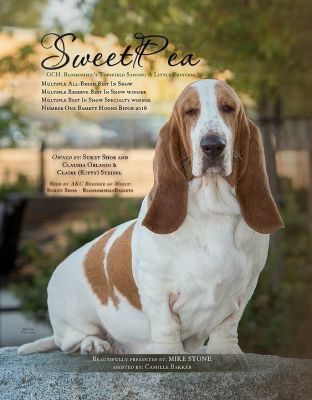 Sweetpea combines breed type and sweet Basset character with sound movement – all of which has made her a Multiple Best in show, Reserve Best in show and Best in specialty Show winner. 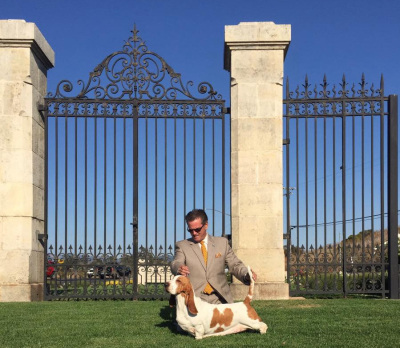 Sweetpea’s success at All Breeds, Nationals and at Specialty shows is a testament to her quality; she is not only a great Basset, but she is also a great Hound. It is said that from the past springs the future. 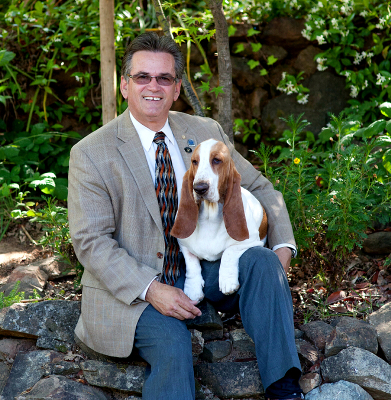 Sweetpea’s pedigree encompasses two long time Kennels: Topsfield (Claudi Orlandi) and Sanchu (Kitty steidel). 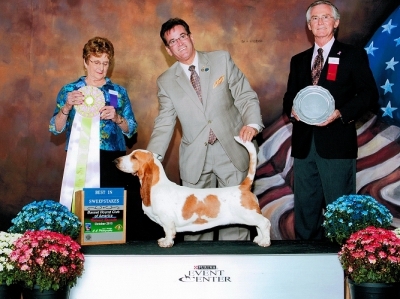 Pea’s mother GCHB Blossomhil’s Mamma Mia and her aunt GCHS Blossomhil’s Hello Dolly made history by each winning the BHCA Nationals in 2010 and 2012. 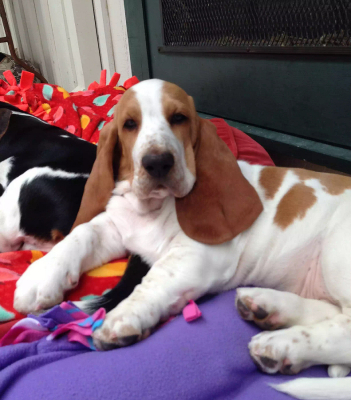 Dolly and Violet maybe the only two to have achieved this distinction of littermates wining our Nationals. 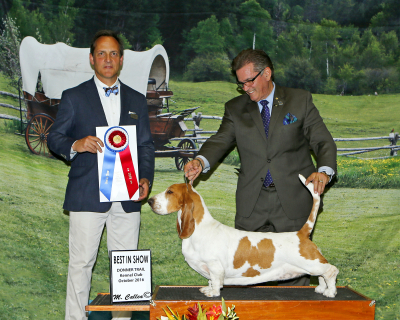 With every award Sweetpea receives it is the judges’ comments on her breed type, elegance, sound movement and sweet temperament that solidifies her greatness in and out of the show ring. 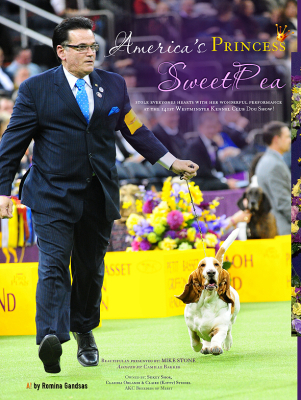 Sweetpea presented by her prince-charming Mr. Mike Stone continues to delight us with their efforts and performances. I am sure she will continue her success winning the hearts of the judges across the country. 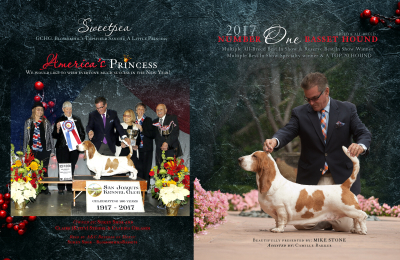 We look forward to the success of Mike and Sweetpea.